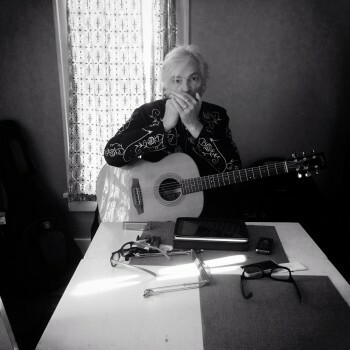 We are excited to announce The Man Upstairs a new album from psychedelic folk troubadour Robyn Hitchcock. The Man Upstairs will be available on August 26. A 4th grade music class from Hillsborough, NC, interviewed Hitchcock for their weekly WOCS podcast – listen in to an excerpt from the podcast, and stream the first song Hitchcock is sharing from the album – a stunning version of the Psychedelic Furs classic “The Ghost in You” – in the media player below. Thus, modern standards like Roxy Music’s “To Turn You On,” The Doors’ “The Crystal Ship,” and The Psychedelic Furs’ “The Ghost In You” are interlaced with lesser-known gems from such pals as Grant-Lee Phillips (“Don’t Look Down”) and I Was A King (“Ferries”), the latter featuring harmony vocals and guitar from the Norwegian indiepop combo’s own Anne Lise Frøkedal. Meanwhile, new Hitchcock originals like “Trouble In Your Blood” and “Comme Toujours” stand among his most fragile and heartfelt, his stark vocal and guitar cast by Boyd against simple, autumnal backing from longtime collaborators Jenny Adejayan (cello), Charlie Francis (piano), and the aforementioned Frøkedal (harmonies). Recorded and mixed at London’s Snap Studio in just one short week last October, The Man Upstairs further comes adorned with delightfully macabre cover art painted exclusively for the album by GRAMMY®-winning singer/songwriter Gillian Welch. Hitchcock will herald The Man Upstairs with a pair of intimate live dates slated for June 20th at Santa Monica’s famed McCabe’s Guitar Shop and Seattle’s Columbia City Theater on June 23rd. A complete North American live itinerary will be announced soon – for more, please see www.robynhitchcock.com/tourdates.